A great-grandmother who took up dance classes at the age of 99 has pirouetted into her 100th year. Jessie Bradshaw goes to lessons organised by Scottish Ballet every week, specially designed for people with dementia. The sprightly OAP has been commended for her natural sense of rhythm, and her daughter Janet, 68, also attends the classes with her. Jessie celebrated her 100th birthday three days before Christmas and was joined by Janet, and her brother Ian, 62. In her youth, Jessie loved watching Fred Astaire and Ginger Rogers on the silver screen. She often went to now-closed Glasgow dance clubs including the Locarno, the Dennistoun Palais and the Majestic, with future husband Harry. They married in 1946, and while living down south, in Bolton, Greater Manchester, continued to share their love of Scottish traditions by attending dances held by the Caledonian Society. While raising three children, including their eldest son Robert who died of cancer in 2016, Jessie and Harry put dancing on hold. But they were active members of the church, and when time allowed they went sequence dancing at St Columba’s Episcopal Church in Clydebank. As well as the physical activity, Jessie enjoyed the company of the people she met at dance groups. And she said that one of the highlights for her still is the chance of a cup of tea and a chat. Jessie said: “I like going because the teacher and staff welcome you as if you are old friends. “The class makes you feel good and the people in the class are easy to talk to. Described by her proud daughter as ‘a true Banky’, Jessie was born in Clydebank, where she still lives. After leaving school she worked for Singers and met future husband Harry, who hailed from Bolton, Greater Manchester, but was enlisted with the Argyll and Sutherland Highlanders. The couple were parted for five years during the Second World War but exchanged love letters despite the distance. Harry was not demobbed until 1946 as the Eighth Army was on guard duty in Austria, and when he returned to Britain the couple married in England, where their two eldest children were born. Back in Scotland, Jessie stayed at home as a housewife before returning to work – where she lied about her age, fearing her true date of birth would stop people from hiring her. And in retirement she kept busy, tending to her garden and going on holiday with Harry. The adventurous couple even spent two months in Japan visiting Janet, who was working there. Jessie never smoked and drank only small amounts of sherry – but attributes her long life to “just keeping going”. Despite her advanced years, she is still independent and pays meticulous attention to folding laundry and drying dishes. Jessie, who has three great-grandchildren, even uses the internet to get video messages from her grandchildren down south. 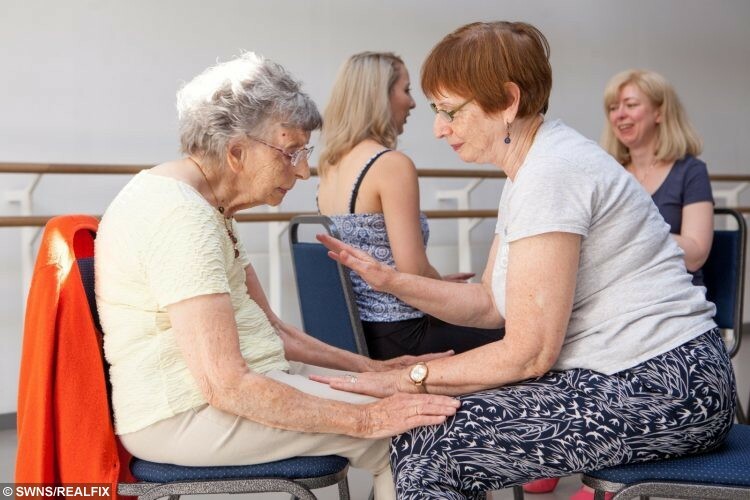 Her daughter Janet said: “I heard about the Creative Dance Class for people living with dementia and their families through an email from Scottish Ballet. “I took Mum along to try the class last February and we have been going regularly ever since. Organised by the Scottish Ballet, the Time to Dance classes are accompanied by live music alternating between guitar and piano. Janet added: “The class is lively, creative and great fun – I find it uplifting and inspirational myself. “But it’s just lovely to watch my mum taking part in her love of dancing once again, albeit she now has to do most of the dance moves whilst sitting down. “The effects are long lasting. She is still lively after the class and is more bright and breezy the next day. “My mum has a great sense of rhythm and enjoys the physical exercise, but what she enjoys, as with all activities she is involved in, is meeting people and enjoying their company. “My mum is of a warm hearted woman who still knows, loves and cares for her family and friends. “She has a fabulous sense of humour and often has us in stitches with her witty jokes.